My name is Ari Weiss and I’m a NYC-based portrait and commercial photographer, and more recently, a vlogger. But before I get into that, let me tell you how I got here. I’m completely self-taught and have never taken a photo class. I studied graphic design in college and my first job outside of school was at a start-up social media advertising agency called Laundry Service and Cycle. I got the job because I designed, produced and published a printed photography magazine called Visual Voice that featured photographers from Instagram. This was the job that launched my career as a photographer and I am forever grateful. As the company grew, I shot social content for clients like LG, Nike, Hennessy, Michelob Ultra, BMW and more. I was hustling 9-5 on set or in the office while also trying to shoot personal content and build my social media following. A huge part of being a photographer is networking and who you know. You can be the best photographer in the world but hard work beats talent, and if you don’t hustle to network, no one will know about you. This is the same with social media where for me, it’s all about collaboration. Starting in 2016 and through 2017, I set about photographing some of the biggest influencers on YouTube. I intentionally made it my strategy on Instagram to post only those photos and as I became known for doing that, I became the person they all hit up in NYC for content. As their YouTube shoutouts in vlogs were getting me more engagement than a photo credit, I quickly realized the power of YouTube. So this year I started my own vlog channel on YouTube @ariweissvlogs. Jumping on a new platform is never easy, and to be honest it’s been extremely intimidating for me. Video and being in front of the camera is new to me, but thankfully I have a bunch of YouTube friends already in the space to learn from and motivate me. As a photographer on social media, it's super important to evolve and find new ways to stay relevant. I never saw myself becoming an online personality until I saw the benefits it could have for my brand as a photographer. People want to know who’s behind the camera. They want to feel connected to you. That’s why it’s called social media. People will appreciate your photos more if they know who you are and YouTube is the perfect place for making that happen. Videos are the future and social media isn’t leaving anytime soon. I think a lot of photographers are too romantic about the work they put out and it holds them back. You have to experiment with new ways of marketing yourself to see what works and what doesn’t. It's 2018 not 2015, and social media is an ever-changing business where if you don’t evolve, you get left behind. I will always have a passion for photography, but vlogging forces me outside of my comfort zone which is something I need right now as a person and professional creative. It forces me to interact with people directly and to create a story throughout the day. 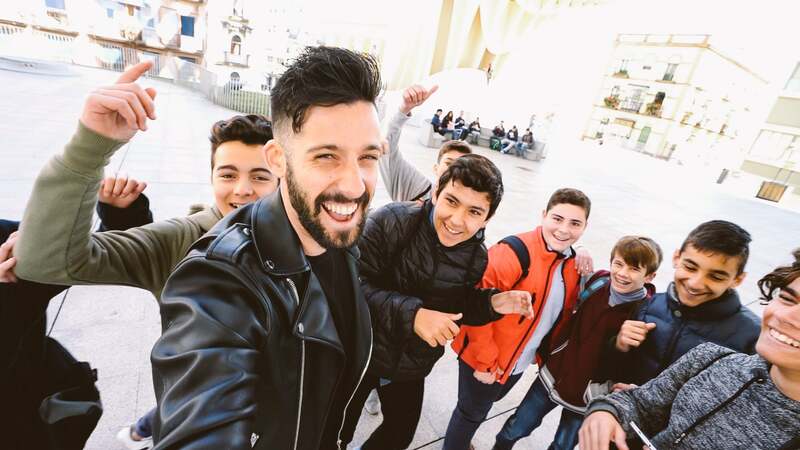 When I was vlogging in Spain for the #AICdoesSpain trip, I found that when I held up the camera, kids would run up to me to want to be in my video. It was bringing people together. I was meeting and interacting with people from a new country I never would have met otherwise. I wasn’t a fly on the wall capturing a moment, I was out there creating moments with other people and recording it on video. And at the end of the day, that was more fulfilling to me than turning inward and taking pictures. Through The Lens In Cuba Premieres!